Find a vacation home to rent in Tibro Municipality from our list of vacation rental properties. Campaya has over 9 vacation homes available in Tibro Municipality, which give you the possibility to locate a unique accommodation in Tibro Municipality which completes your check-list in search for the perfect self catering vacation apartments in Tibro Municipality or vacation villas in Tibro Municipality. Lovely holiday homes in the summer house idyll Ransberg / Fagersanna in high location with panoramic views of the Örlen. 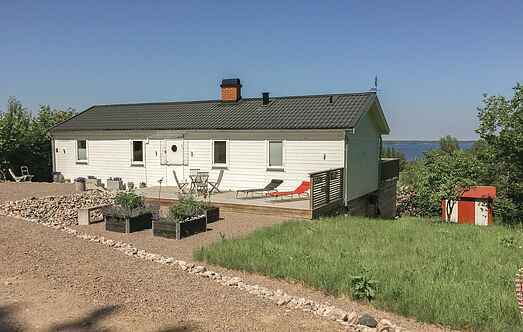 Nice part of a holiday home which is situated 20 metres from the lake of Örlen with a family-friendly bathing place and good angling possibilities. 15 km to Karlsborg and the Göta Canal. This cosy holiday home is situated in an established cottage area and is just 200 metres from the beautiful swimming and fishing Lake Örlen. Enjoy the secluded location near the forest and the proximity to hiking trails, mushroom occurrence and the many fishing lakes with the purest water. Elevated holiday home in developed recreational home area with a beautiful view down to the lake Örlen. On it there is a wonderful, family-friendly beach with a diving board and jetty. Have a lovely self-catering getaway with this charming holiday home. The property is an attractive farmhouse with a beautiful countryside location. This conveniently located holiday home can be found on an attractive and safe beach plot. The interior is cosy and comfortable, providing a good place to rest and relax. On the edge of the idyllic Fagersanna, a prospect in Richtug Nya Örlenbadet, a nice bathroom for families offering, this holiday home. Here the boat is moored fishing.